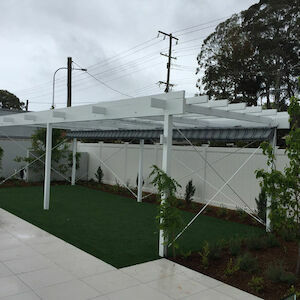 A unique retractable sail system that provides fantastic shading - on demand. When the weather's nice, getting outdoors and relaxing in the warm sun is a wonderful feeling. In Australian climates, however, sometimes the heat can be too much. If you have an effective means of shading you can block out this unwanted heat and enjoy the outdoors in comfort and style. Using high quality polyester mesh fabric, the Shaderunner is extended on hot days to provide up to 95% UV protection. The on colder days it can be folded away to let in natural sunlight and warmth. Marine grade stainless steel fixings and fittings, along with waterproof fabric options make the Shaderunner a fantastic all-purpose solution for sun wind and rain.